I can’t process metaphor before 10 am. (Yes, that’s a simile in the title and not a metaphor – yes, it’s from The Tick – oh, you didn’t know that one? Not feeling so smart now, are you Sassy McSassypants?) It’s unfortunately true, before 10 I’m the most literal minded person you know or maybe the most literal person that I personally can be (I do have certain limitations and I really haven’t met all your friends, so the whole “you know” thing is a bit bold of me). Anyway, yesterday morning it’s so far before 10 that my brain hurts and I’m listening to NPR – a story on the Federal Reserve. The reporter says something along the lines of “some people believe the Fed set fires so they could put them out.” ARSONISTS??? Ben Bernanke, Chairman of the Federal Reserve is an arsonist!! I can’t believe they thought they could get away with it. I mean, with today’s technology that forensic fire people employ, honestly. How stupid could they be? I am shocked!! And why haven’t I heard about this before? Well, that’s what I get for reading MSNBC.com vs. NYTimes.com – mental note, change online news source. Thank God, I’m listening now – I would have never known. Wow, I can’t believe they tried to get away with that. Wait. Crap. Nevermind. My pre-10 am brain, is clearly just a crazy disjointed jungle gym built by M.C. 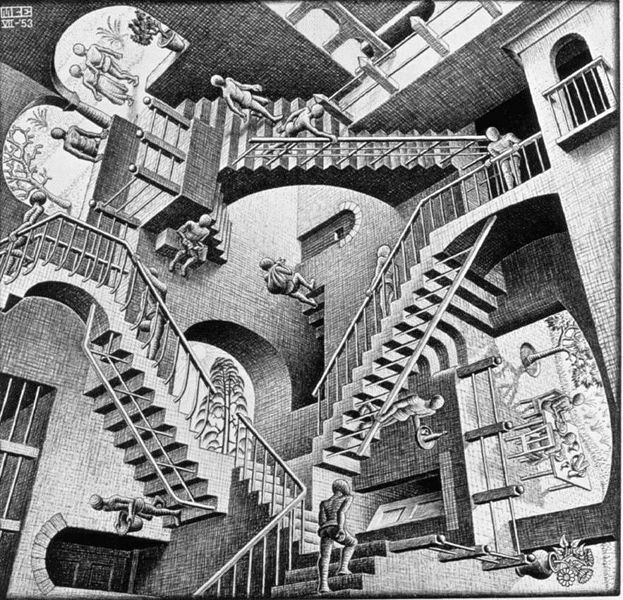 Escher’s evil understudy where I get to learn all sorts of amazing and largely untrue things about the world I live in. My post 10 brain; however, enjoys mocking it. Still, there should be a ban on metaphor before noon.